Hello Friends! All I can say is TGIF! This week has been dragging, it seems. I'm so excited for the weekend and to finally see some sunshine after today. The rainy, dreary weather gets old quickly, but the forecast after today is pure sunshine. I'm planning to spend lots of time outside with Madeline this weekend, once the rain finally goes away. Today, I'm styling what is quite possibly one of my favorite sweaters of all time. 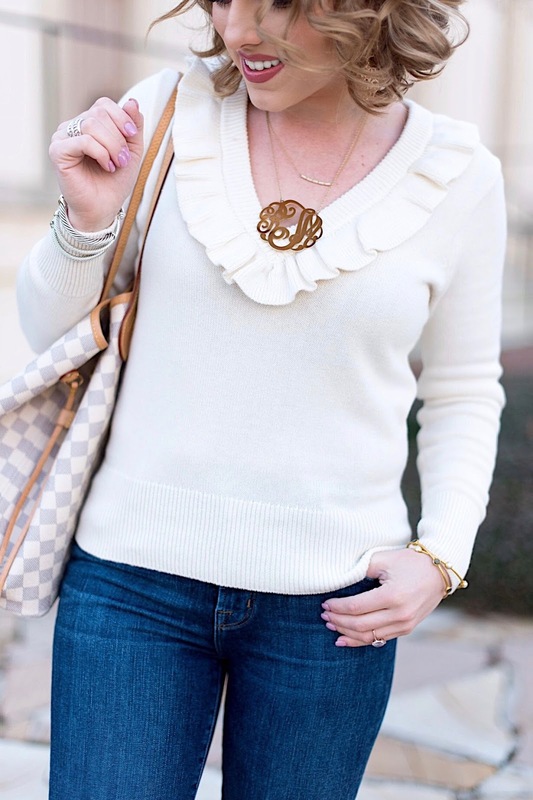 It's no secret that I have a light ruffle obsession. When I saw this sweater, I knew that I'd get a ton of use out of it. I also think it would be darling paired with a skirt and knee high boots as well. But for every day, this is how I prefer to style it. It's under $80 and also comes in two other colors (pink and navy). I'm seriously crushing on the pink and am thinking about ordering it as well. Also, the more ruffles, the merrier! How darling are these ruffle mules?! I mean, pink, pearls and ruffles...these shoes are too good to be true :) Pink, ruffles, pearls (and don't forget the hint of gold) are just a few of my favorites. They also come in several other colors and are under $70. Thanks so much for stopping by, y'all! Have an amazing weekend! 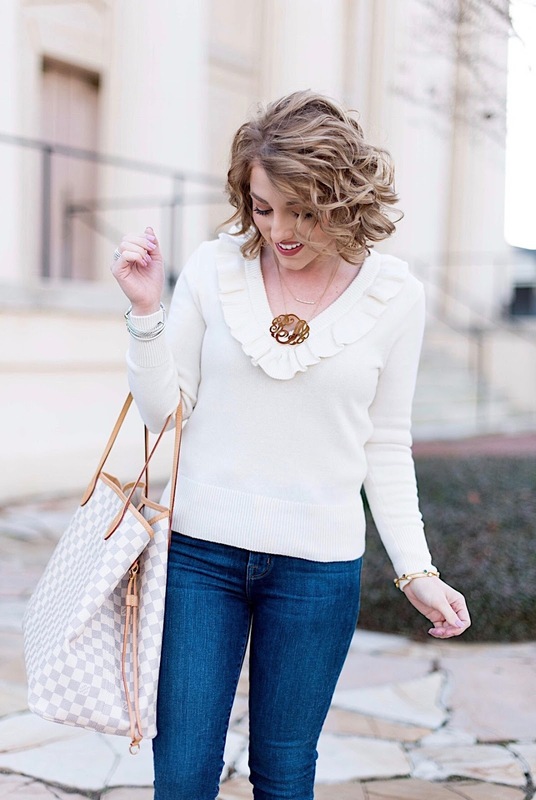 I love your sweater, so cute and classic with that ruffle!